This week marks the fifth annual World Hepatitis Day, an international awareness initiative organized by the World Hepatitis Alliance (WHA) and the World Health Organization (WHO) to help raise global awareness for hepatitis C virus (HCV) and hepatitis B virus (HBV). World Hepatitis Day is one of only four disease awareness days officially recognized by the WHO. It is being led by the WHA, a partnership of more than 200 patient-led organizations around the globe dedicated to helping prevent and combat viral liver disease on a widespread scale. The WHO estimates that nearly 400 million people are living with hep B or C worldwide and that up to 1.4 million people die from viral hepatitis every year. In the United States, it is estimated that 5.3 million people are living with viral liver disease, and that the majority of them are still unaware of their hepatitis status. Together, HBV and HCV cause approximately 80 percent of global liver cancer deaths. This year, the WHA has organized a massive social media call to action titled “4,000 Voices,” which is calling out to 4,000 people worldwide to raise awareness about viral hepatitis. The number is in recognition of the nearly 4,000 people who die from hep B or C every day worldwide. Advocates are asking people to use the hashtag #4000Voices on Twitter, upload a World Hepatitis Day image as their social media avatar or post a photo to the WHO online interactive map of global tweets. 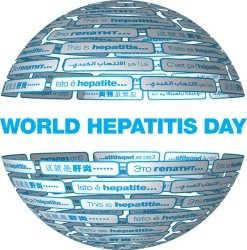 The WHO is also using the hashtags #WorldHepatitisDay, #PreventHepatitis and #Hepatitis to help spread awareness.